This page describes gain vs frequency response of RF filter types. There are four types of RF filters viz. lowpass filter (LPF),Highpass filter (HPF),Bandpass filter (BPF) and Bandstop filter (BSF). Filters are categorized into active filter and passive filter. They are also categorized into analog filters and digital filters. The electronic circuit which changes amplitude and phase angle of electrical signal based on frequency is known as frequency filter. The filter which operates on radio frequency is known as RF filter. Based on type of components used in the design of filter there are two types viz. passive filter and active filter. It uses passive components such as coils or inductors (L), capacitors (C) and resistors (R) in the construction of filter. Hence it is known as passive filter. It uses active components such as operational amplifier in addition to R and C in the construction of the filter. Hence it is known as active filter. The analog filters are made of discrete components. Digital Filter: The digital filters are usually developed in programming languages which are ported on ASIC, FPGA or DSP or other processors. They perform operation as per algorithm written. A LPF permits all the lower frequencies of a signal upto desired cutoff frequency to pass through with little or no attenuation. All the frequencies above the cutoff frequency are attenuated. A HPF permits all the higher frequencies of a signal from defined cutoff frequency with little or no attenuation. All the frequencies below the cutoff frequency are attenuated. A BPF permits signals within specific frequency bands to pass through. All the signal frequencies below and above the passband are attenuated or blocked. The BSF suppress specific frequency range and permits all other frequencies which are in lower and higher range. 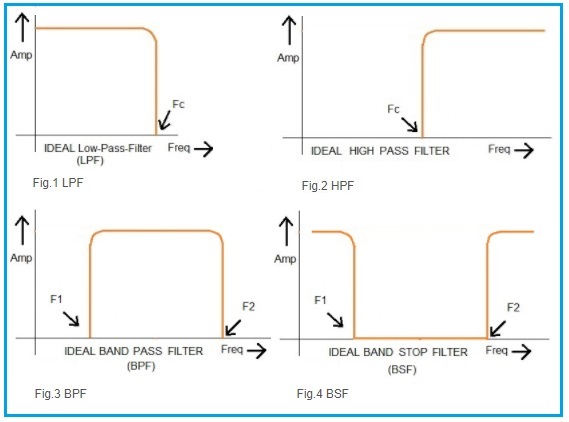 Refer LPF vs HPF vs BPF vs BSF>> and All Pass Filter basics and types>> for more information.